Supplements I'm Taking Whilst Vegan & Pregnant. I can't believe I'm 29- about to be 30 weeks pregnant, can you? Where is the time going?? I blink and another week has flown right by. Between working full time, sleeping and trying to organize life to accommodate a soon to be very real baby on the weekends, I have had little to no time at all to blog about anything I've really wanted to, let alone keep you updated on preggo life! As most pregnant women do, however, I've been regularly taking vitamins to help support my body whilst it grows another human. I spent hours searching for vegan-friendly prenatal capsules, reading reviews and weighing the cost per capsule before I finally made my choices. 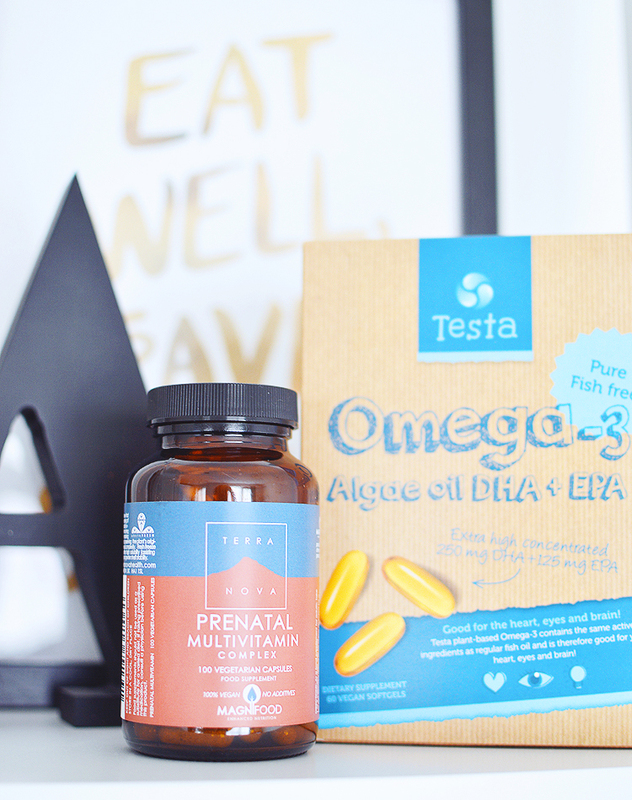 In the end I decided on an algae oil based omega 3 from the brand Testa, and a Prenatal multivitamin from Terra Nova. These seemed like the best value to me for vegan, high-quality vitamins. Some of the prices for vitamins are shocking with 30-60 caps sometimes for over £30! I get that they have everything in them and are organic etc, but seriously, if you have to take two a day that's not a lot for your money. The Terra Nova Prenatal Multivitamins are £20.50 for 100 capsules. Taking two capsules a day obviously lasts me 50 days, though with the odd forgotten day here and there a bottle has lasted me two months and works out at 41p per two capsules/day. What I like about these capsules is that they contain folate instead of folic acid. Folate (Vitamin B9) is the naturally occurring form of synthetically produced Folic Acid. Converting synthetic folic acid into the active form of Vitamin B9 is a much slower and less efficient process for the body, which can lead to un-metabolized folic acid hanging around the bloodstream leading to health problems. The body can handle folate much easier than folic acid, converting it quickly into B9 in the digestive system before it enters the bloodstream. The capsules also contain the natural, most bio-available version of B12, methylcobalamin, as opposed to commonly used cyanocobalamin, which the body has to convert to methylcobalamin and discard of the cyano-compound (cyanide molecule!) anyway before it can be used. Plus, there's vegan vitamin D3 and iodine! Whilst vitamins are no replacement for a healthy diet and lifestyle, I have felt better taking these daily, my energy levels have been good and I haven't experienced any huge negatives with pregnancy other than the odd ache and pain so far. My skin has been a solid 8/10 and my nails are so strong they're practically weapons. I also have peace of mind that I'm still getting some good nutrients into my body for the baby whilst I'm eating pizza and ice cream for the second time that week. Whilst taking an omega 3 supplement seems to not be a necessity for pregnancy, DHA is important for brain and vision developments, so I wanted to take this as an added extra. Especially as I don't find myself eating a lot of chia pudding or flax seeds to get lots of omega 3! The Testa Omega 3 capsules are £16.90 for 60 capsules, but unlike most variations, you only need 1 capsule per day, which works out at 28p per day over the two months. The downside is that the capsules are large (not massive, but pretty chunky!) so if this is an issue for you, you may need to look for other brands where you take two smaller capsules per day for the same dose. Each capsule contains 250mg DHA and 125mg EPA for healthy heart, eye and brain development, there is no fishy taste or smell at all and I'm sure they're contributing to my skin improvements and general wellbeing, which isn't their purpose but an added bonus! Algae oil (Schizochytrium sp. ), glycerol, modified corn starch*, high oleic sunflower oil, carrageenan, rosemary extract, anti-oxidants (tocopherols and ascorbyl palmitate) and acidity regulator (sodium carbonate). 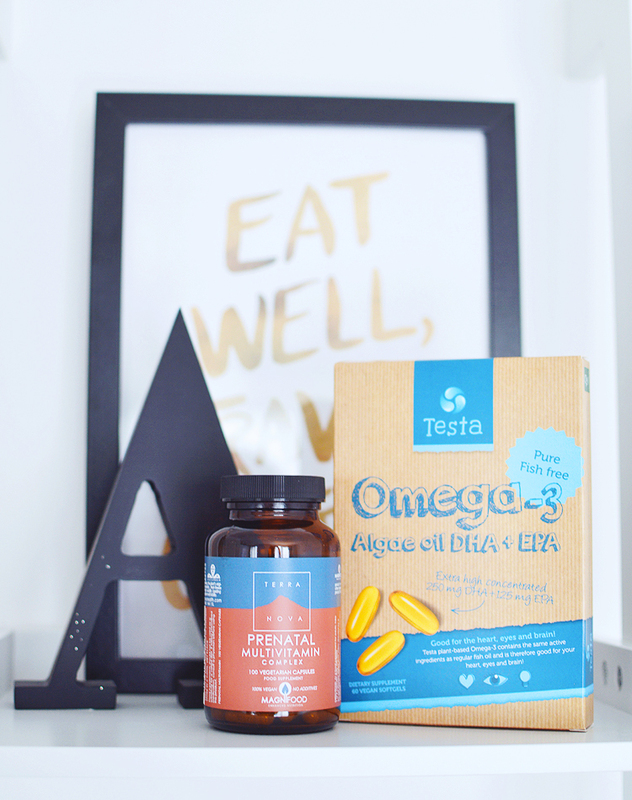 Testa Omega-3 uses absolutely no genetically engineered ingredients, no preservatives, and no sweeteners, flavours or colours. *'Modified' Corn Starch only means the corn starch is 'modified', not to confuse with 'Genetically Modified'. For the corn starch, it means it's heated so it gets binding properties, which is required for the capsule shell. For 69p a day, I'm happy with my choices and will continue to take these after pregnancy too, to support breastfeeding and passing on extra nutrients to baby - if all goes well! That's something I'm very nervous about as I don't like the idea of cows milk or even a vegan soya formula much. Fingers crossed everything works as it should!